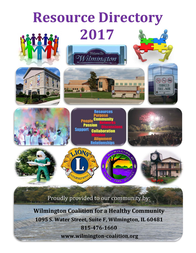 The Wilmington Coalition for a Healthy Community (WCHC) partners with many other groups and organizations with the goal of reducing the toll of opioid and other drug overdoses in Southern Will County. In 2016, the WCHC spearheaded community fundraising efforts to provide a canine officer for the community. Thanks to funding from residents and from the Will County State’s Attorney’s Office, Wilmington Police Department Canine Officer Mao began work in early 2017. The WCHC works with other organizations funded by the federal Drug-Free Communities Support Program and other local drug-free coalitions to share information and collaborate on projects to reduce opioid and other drug abuse. The coalition participates in the Will County MAPP (Mobilizing for Action through Planning and Partnership) Collaboration to obtain information and link to resources in other communities. Funded by SAMSHA and O.N.D.C.P.